This collection of essays about life in New Mexico by one of the state's finest writers tells of the state's unique charm. What is New Mexico? Of the many writers who have tried to answer that question, Tony Hillerman comes the closest to answering it without romanticizing the desert country. He is not a historian, not a guidebook-writer; his book, as he says, is "not intended to convert the Lubbokc-Jersey City philistia or to please any chambers of commerce." 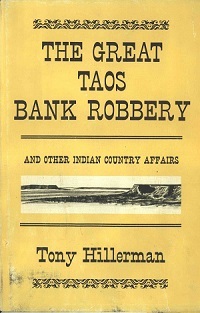 The essays that make up The Great Taos Bank Robbery tell of a wide variety of incidents, characters, and places that "offer insights into the mystique of this high dry tag-end of the American Rockies."